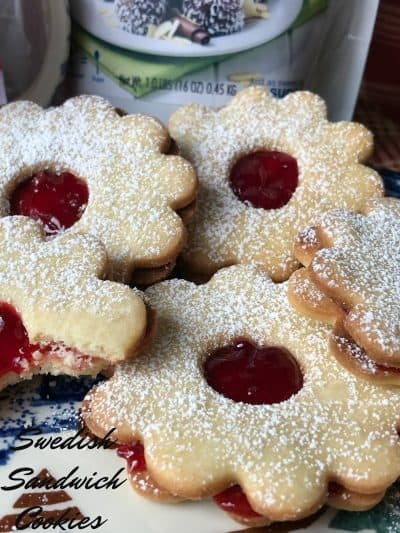 Swedish Sandwich Cookies or Syltkakor are delicious buttery cookies made with KetoseSweet. 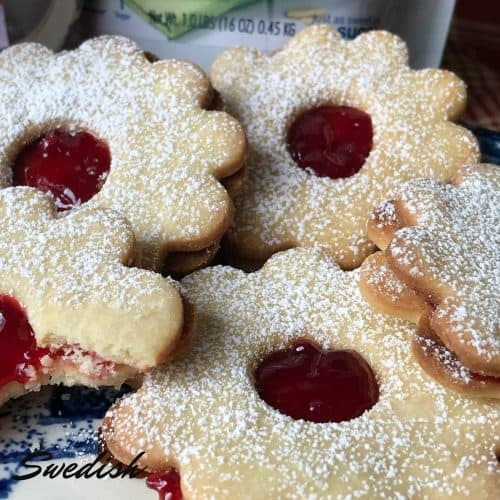 These super delicious cookies have a layer of Lingonberry jam sandwiched in the middle. The cookies are then dusted with powdered sugar for added sweetness. Syltkakor are traditional Swedish sandwich cookies are most often served on Christmas cookie trays. This is a sponsored post and all opinions are my own. 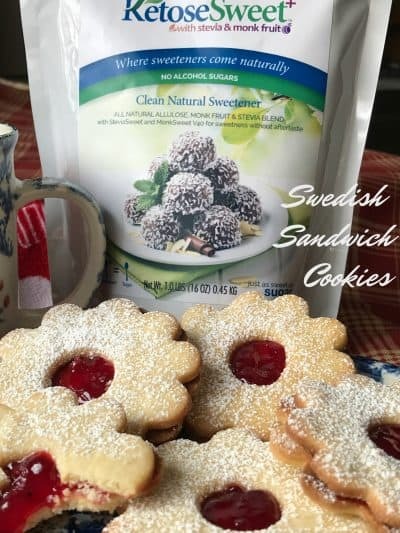 I entered this recipe for Swedish Sandwich Cookies in the KetoseSweet Recipe Challenge. I received one 16 oz. package of KetoseSweet and one 23 oz bottle liquid KetoseSweet. With the holidays fast approaching, I decided to submit a recipe for Christmas cookies using KetoseSweet. KetoseSweet is an all natural Allulose, Monk Fruit & Stevia Blend. 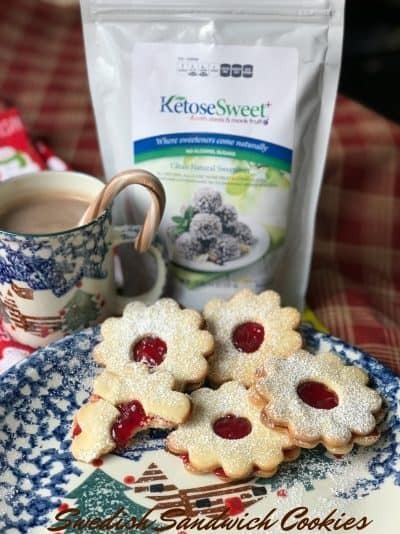 KetoseSweet contains allulose, a rare natural sugar found in maple syrup, figs and raisins. It’s safe, low-calorie, low-glycemic sweetener, with just 5% of the calories of regular sugar. It delivers familiar taste and texture without affecting blood sugar levels and it’s free from aftertaste and bitterness. Safe for those following a low-sugar or low-carb diet. It’s Keto and Paleo friendly and Diabetic safe. You can substitute raspberry, strawberry, blueberry or your favorite jam flavor for the Lingonberry jam called for in this recipe. We happened to have Lingonberry jam in our pantry, no doubt from a recent trip to IKEA. Want to try something a little different? Substitute lemon or lime curd. Even a smear of fig preserves or Nutella would be a nice change of pace from the usual jam choices. Often the holidays are filled with many sugary sweets. Why not cut a few calories this holiday season and use KetoseSweet in recipes containing regular sugar. Anyone on a special diet, watching their weight or people with diabetes, will be happy to have a delicious cookie or two to indulge in. Even Santa Claus needs to watch his sugar intake during the holidays. After all, he has to eat a lot of cookies on his world travels. Follow Steviva on all social media. Facebook, Twitter, Instagram, Pinterest. 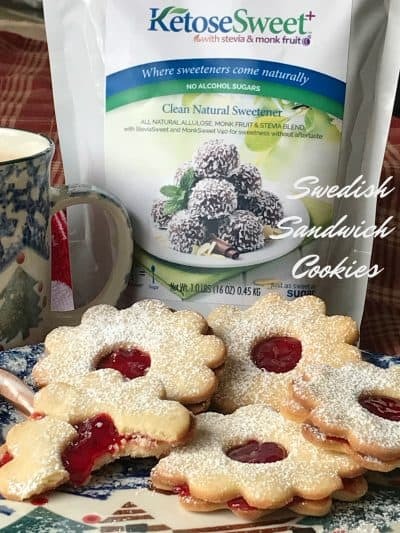 Swedish Sandwich Cookies are proof that KetoseSweet is great for cooking and baking. Use KetoseSweet in all of your holiday recipes. This recipe is made with KetoseSweet. Beat butter and 1/2 cup sugar in large bowl with electric mixer at medium speed until light and fluffy, scraping down side of bowl once. Beat in egg yolks and almond extract scraping down side of bowl once. Gradually add the 1 1/2 cups flour; beat at low speed until well blended. Stir in additional flour with spoon to form stiff dough. Form dough into 2 discs; wrap and refrigerate until form, at least 2 hours. Preheat oven to 375 degrees. Unwrap 1 disc and place on lightly floured surface. Roll out dough with lightly floured rolling pin to 3/16-inch thickness. Cut dough with floured 2 1/4-inch round cookie cutter. Place cookies 1 1/2 to 2 inches apart on prepared cookie sheets. Gently knead dough trimmings together; reroll and cut out more cookies. Repeat step 4 with second disc. Cut dough with floured 2 1/4-inch scalloped cookie cutter. Cut 1-inch centers out of scalloped cookies. Place cookies 1 1/2 to 2 inches apart on prepared cookie sheets. Cut equal numbers of round and scalloped cookies. Beat egg whites in a small bowl with wire whisk. Place remaining 2 tablespoons sugar in small cup. Brush each scalloped cookie with egg white; Sprinkle with sugar. Bake cookies 8 to 10 minutes or until firm and light golden brown. Remove cookies with spatula to wire racks; cool completely. 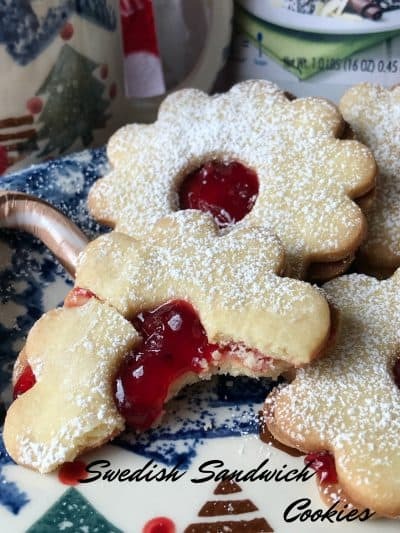 To assemble cookies: spread about 1/2 teaspoon lingonberry jam over flat side of round cookies; top with flat side of scalloped cookies to form sandwich. Dust cookies with powdered sugar. This recipe can be made with regular sugar also. Use the same amount of sugar as you do KetoseSweet. Do you like cookies? We love them! Here are a few more cookie recipes you will want to try. Valentine Sandwich Cookies and Back to School Pencil Cookies.